Community Bank of the Bay strives to make a positive and sustainable economic impact on their community by providing local businesses and non-profit organizations a committed and resourceful financial partner who can help them achieve their goals and build a healthy and economically inclusive community. 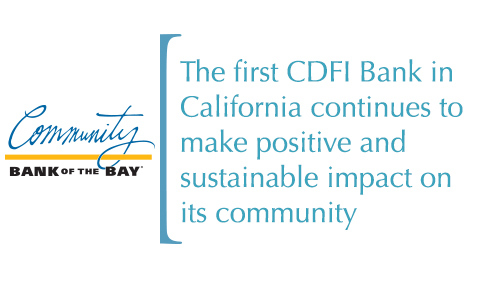 Community Bank of the Bay (CBB) was founded in 1996 as the first certified CDFI bank in California. CBB operates from four California locations: Oakland (headquarters), Danville, San Jose and San Mateo. As a commercial bank CBB offers loan products and financial services designed with local business customers in mind as they represent the substantial majority of the Bank’s client base. The Bank’s products, particularly the loan products, are highly flexible and are adapted to the needs of the individual borrower to the greatest extent possible. The Bank also offers a wide range of deposit and Cash Management products that include remote deposit capture and automated clearing house payment and debiting services, Business Mobile Banking, e-Statements, and Debit Cards. CBB is locally owned and operated, with a focus on financing small and mid-sized businesses, non-profits and real estate projects that in turn create quality local jobs. To further enhance its community reach CBB works closely with the California Capital Access Program, Inner City Advisors, Pacific Community Ventures, Working Solutions, Cutting Edge Capital, and the Alameda County Small Business Development Center to help fund loans to businesses that might not otherwise qualify for traditional credit. In 2006, CBB established the Bay Area Green Fund. CBB made a commitment to Bay Area Green Fund depositors to use their funds for environmentally sustainable businesses and projects. An independent, non-management Council of environmental experts validates “green” loans. CBB partners with the Sustainable Business Alliance, Sustainable Silicon Valley and others to support environmental sustainability in the Bay Area. The Bank works hard to fulfill its mission of making a positive and sustainable economic impact on its community. All employees are provided with paid time off for volunteer activities and CBB management and staff dedicate many hours to worthwhile service organizations throughout the year, helping local business groups, neighborhood improvement councils and youth and family organizations. It invests in creative solutions to big problems, such as sponsoring mobile apps that teach financial literacy and creating its own Bay Area Green Fund, a unique program that allows environmentally conscious depositors to direct their funds to environmentally sustainable projects and businesses. For its unique combination of financial performance and commitment to bringing creative solutions to community and environmental problems, the Western Independent Bankers Association named Community Bank of the Bay its 2015 Bank of the Year.